Dan was born and raised in Western New York. 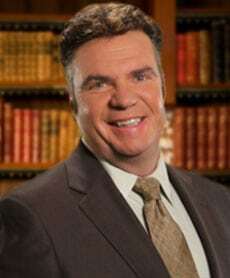 He is a graduate of Buffalo State College, and attended law school at Western New England College in Springfield, Mass., where he obtained his law degree in 1989. Throughout law school, Dan concentrated his efforts in both criminal and civil litigation. After law school, he returned to Western New York and began working under the direct tutelage of the founder of the firm, John E. Nicholas. Shortly thereafter, an opportunity was presented to Dan to open up a new branch of the existing law firm in the Central New York area. In 1993, the firm opened its doors in Syracuse, New York, under the management and supervision of Dan Smith. The new firm became known as Nicholas, Perot, Smith, Welch & Smith, which now serves the entire Central New York area, including Syracuse, Utica, Watertown, Elmira, and Rochester. Upon John Nicholas’s retirement in May 2004, Dan was presented with the opportunity to take over for his mentor and became President of the law offices of Nicholas, Perot, and Smith. He currently resides in Central New York, but spends a great deal of his time in all of the offices. He enjoys sports, travel, the outdoors, and spending time with his family. Dan is a member of numerous County Bar Associations, the New York State Bar Association, the New York Trial Lawyers Association, and is a member in good standing of the American Association of Justice’s Nursing Home Litigation group.